A valid drivers license image will be required for the purchase of this unit matching the shipping address before this item can be shipped out. 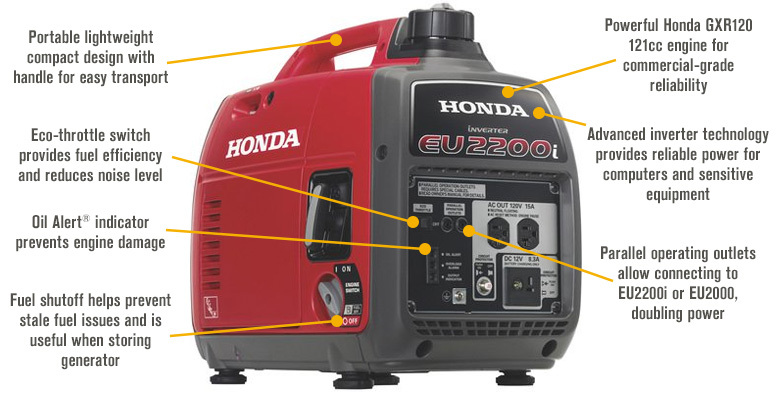 The Honda EU2200i Portable Inverter Generator represents the leading edge of portable power technology. Now delivering 10% more power, the newly designed EU2200i offers greater performance combined with ease of use and simplified maintenance. Technical enhancements result in more power and maximum output at lower RPMs, delivering customers quiet, efficient portable power. 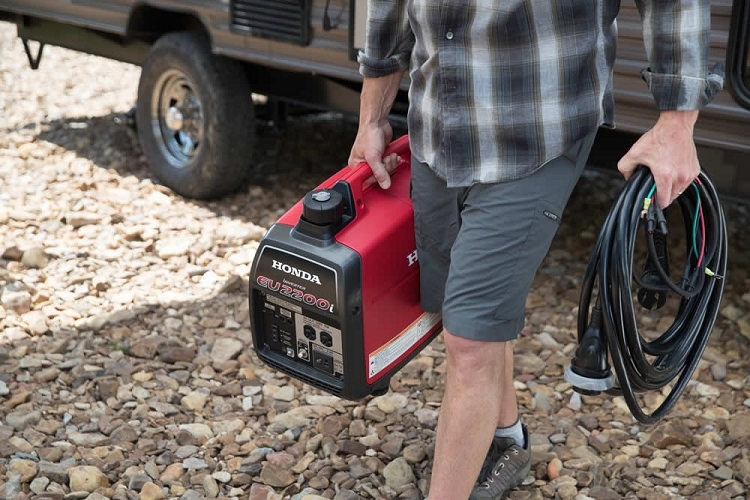 With a lightweight, compact design, this versatile generator provides easy portability for camping, recreation, and home backup power, jobsites and more. The Honda EU2200i features a fuel-efficient, smooth-running Honda engine that is reliable and super quiet, producing less noise than a normal conversation. Plus, when connected to another EU2200i or EU2000 inverter generator using a parallel kit you get double the power! 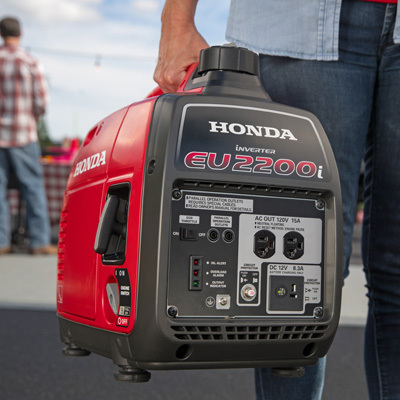 The Honda EU2200i delivers 10 percent more power than the legendary top-selling Honda EU2000i model, allowing you to power more of what you need. 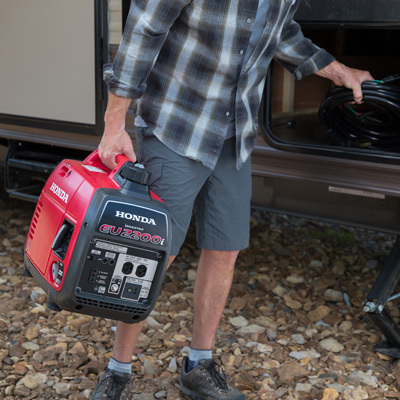 The Honda EU2200i Inverter Generator provides dependable electricity for camping, outdoor recreation, jobsites and projects outside the home. Use it to power a variety of appliances, including televisions, microwaves, refrigerators and even small air conditioners. 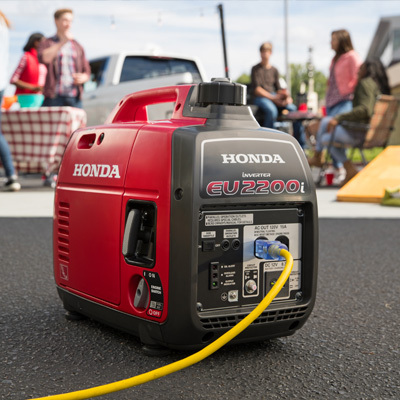 With a remarkably low 53 to 59dB noise level, the Honda EU2200i is super quiet for use virtually anywhere — great for campgrounds, backyard parties, tailgating and anywhere you need reliable power with minimal noise. The EU2200i also features special sound-dampening materials and Honda's exclusive Eco-Throttle™ system to help reduce the noise level by not requiring the engine to run at full speed constantly. Weighing less than 47 lbs., the EU2200i is the ultimate portable power solution. The built-in handle makes the EU2200i convenient to carry. Plus, the compact size neatly fits in your car, truck, boat, RV or camper, making this versatile inverter generator the ideal tag-along. Powering sensitive electronics requires clean, stable electricity. The Honda EU2200i Inverter Generator delivers electricity as reliable as the power you get from outlets in your home. Feel confident safely running computers, televisions, phones, kitchen appliances and more without fear of interruption or damage to equipment. 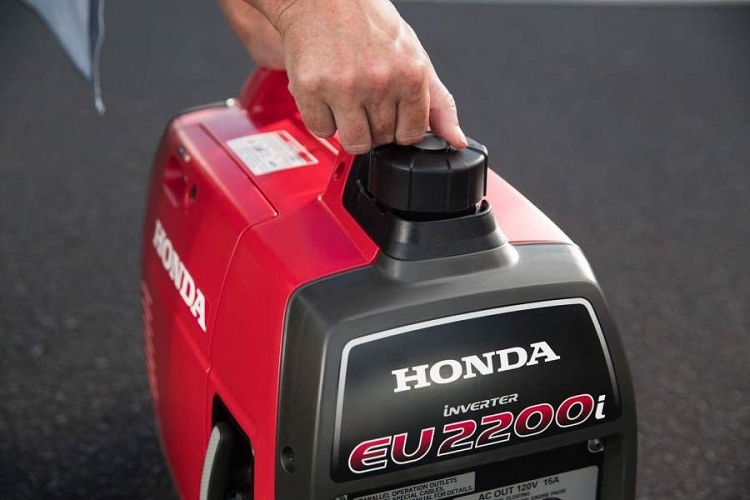 Equipped with Honda's exclusive Eco-Throttle System, the EU2200i runs up to 8.1 hours on just 1.1 gallon of fuel — ideal for maintaining overnight power. Eco-Throttle™ allows the generator's engine to automatically adjust the engine speed to produce only the power needed for the application in use and helps to reduce exhaust emissions. This CARB-compliant model also features a U.S. Forest-approved spark arrestor for safe use in parks and forests. The all-new EU2200i includes features to deliver ease of use, simplified maintenance and durable, dependable operation. Technical enhancements result in more power and maximum output at lower RPMs for quiet, efficient portable power for work, home or play. Plus, the EU2200i boasts several key user-friendly enhancements. Color-coded startup components simplify starting of the generator. Larger oil fill and drain make for easier and cleaner oil changes and the fuel shut off valve assures the EU2200i inverter generator is easier to use and maintain. Need more power? 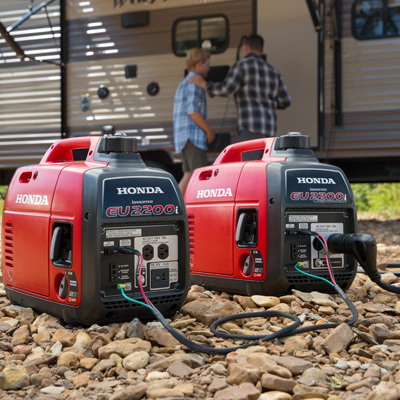 When connected with another Honda EU2200i inverter generator using a parallel kit (not included), the EU2200i provides up to 4400 Watts of power without having to trade up for a larger, heavier generator. You get more power without sacrificing portability. 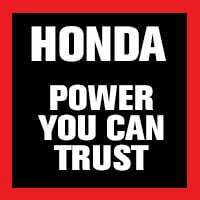 Since 1953, Honda has manufactured over 40 million power products worldwide and continues as a leader in high-performing generators. 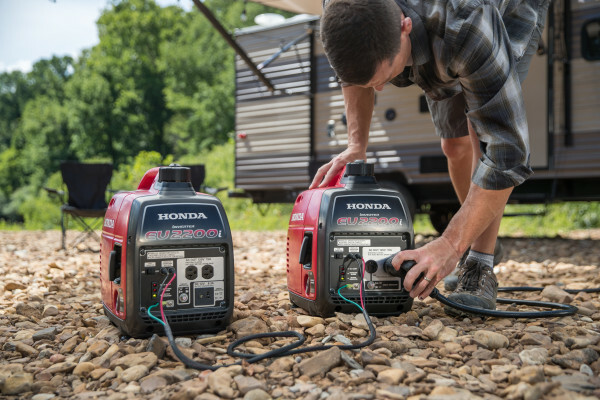 RV Parts Country carries a full line of Honda portable generators and inverter generators. Find the right power solution for play, home and work at RV Parts Country. 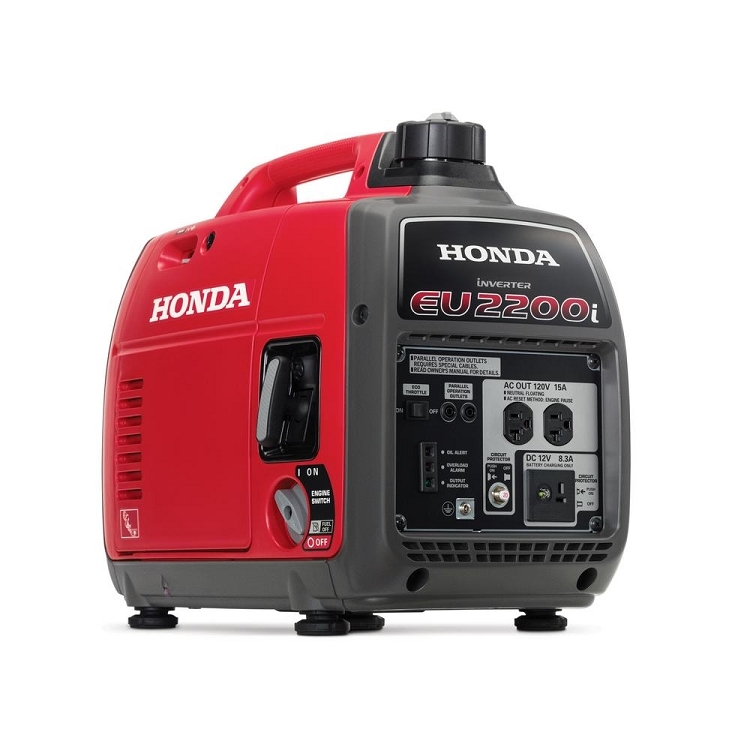 I bought the Eu2000i Honda generator and it was more than what I expected. I really loved how quiet the Honda EU2000i generator was. They shipped that Honda generator the same day that I ordered and I got it the next day. RV Parts Country offers 5 star service on their Honda EU2000i generators and I'm very glad I bought from these folks! I just got it and am going to give it a 5, but I'm giving it a 4 because I ain't used it but I'll let you all know!!!! Dera RV.Parts: ------------- Please need to know al about this machine. may you help on this please?